1. Preheat oven to 350⁰F. Prepare an 8 ½ x 11-inch baking dish by coating lightly with cooking spray. 1. Poach the chicken in a medium-sized skillet over medium-high heat. When the chicken is cooked through, set aside and shred once cooled. 1. Heat canola oil in a large skillet over medium-high heat. Add the garlic and let cook until fragrant, about 1 minute. Add the vegetables, cooking until tender crisp. Stir the cumin, salsa and shredded chicken into the vegetable mixture and heat through. Remove skillet from heat. 1. Layer a tortilla with ⅛ cup cheese and ⅛ of chicken and vegetable mixture. Wrap tortilla and place seam side down in prepared baking dish. Repeat layering until all of mixture has been used. Top with enchilada sauce and remaining cheese. 1. Cover dish with aluminum foil and bake for 25-30 minutes or until dish is bubbling and cheese is melted. 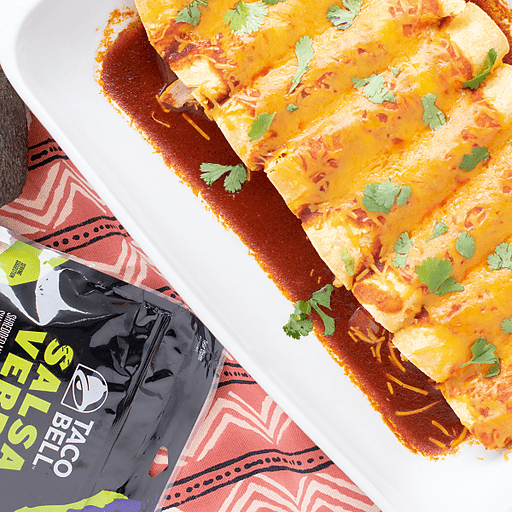 Serve hot with optional toppings. Optional toppings: cilantro, guacamole, nonfat plain Greek yogurt If you find that your corn tortillas are breaking while assemblig, wrap a stack of corn tortillas in a damp paper towel and microwave for 20-30 seconds. This will make them more pliable. Per Serving: Calories 280, Total Fat 14g (Saturated 5g, Trans Fat 0g), Cholesterol 50mg, Sodium 760mg, Total Carbohydrate 22g (Dietary Fiber 9g, Sugars 5g), Protein 24g, Vitamin A 25%, Vitamin C 90%, Calcium 35%, Iron 15% *Nutritional values are an approximation. Actual nutritional values may vary due to preparation techniques, variations related to suppliers, regional and seasonal differences, or rounding.